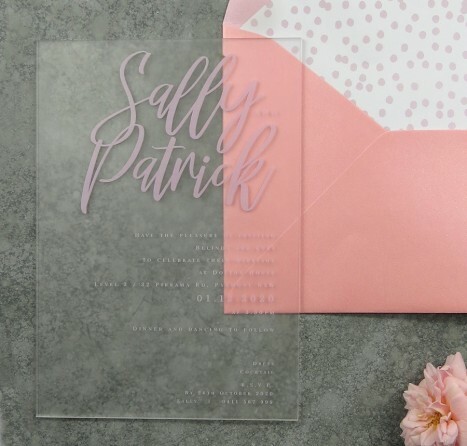 Stunning modern frosted acrylic wedding invitations! Hit the latest trend these beauties - as they are set to impress. They are wonderful in the hand as a lovely thick quality feeling product. They are 2.5mm in thickness but can still be sent as a normal letter. We can change up the envelope to any colour to drastically change the feel of this invite and match up your theme. We can also change the colour of the text to whatever you want at no extra charge. Please note that the liners are not included. We have a vast variety available as an extra all would look amazing with this striking design! Head over to our liner section on the sire to have a look. Florals, stripes everything will look amazing with this striking design. Have some fun matching it up. Size is 5 x 7 inch. We hope you love this beauty as much as we do!